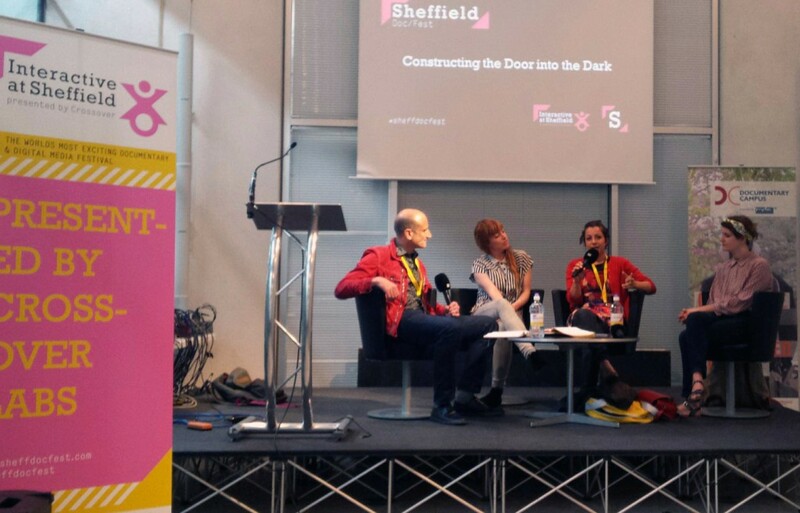 Door into the Dark – an immersive documentary experience about what it means to be lost, from producers Anagram – was fully booked throughout Sheffield Doc/Fest and has been receiving nothing but praise from its’ participants since. The inspiration to create their own interactive documentary experience emerged out of a debate around what interactivity is within the documentary format. When they looked at a number of existing i-docs, a lot of the time the interaction is poorly realised. For their project, they wanted the participants to really be involved and what better way to do this than to immerse them in the story. The project was influenced by a Secret Cinema event they attended, where they witnessed a dance routine take place: “We were walking around and feeling fairly disengaged, not connected to what was going on – until a dance routine started and it triggered a realisation of what it means for your body to take part in something – you need to go beyond just looking, and involve the rest of the body to feel completely immersed”. Having your body move through the space within Door into the Dark certainly adds the physical element that can’t be achieved within screen-based documentaries. However, having your sight taken away from you takes this immersion one step further, as May and Amy put it: “The value of giving yourself up to the ambiguity of uncertainty”. As with most interactive documentary projects, constructing DITD took a team that went far beyond a traditional documentary collaboration. The cross-disciplinary team was really important to the success of the project. Involving Flo Hickson, Tabitha Pope and Aaron Robinson meant they had a range of people to create the sets and realise ideas, commenting: “You make much better work if you open yourself to working with different people”. Designing a set for touch meant they had to focus on the tactile rather than the visual, asking themselves and the designers ‘What does it feel like if you don’t know what it looks like?’. Having the work-in-progress installation during i-Docs 2014 allowed them to progress their ideas around how the project should work: “we kept thinking that participants were doing it wrong, but from following the feedback, it’s just learning to be patient and allowing people to explore”. This notion of control was something that was raised a number of times throughout the interactive at Sheffield sessions: “Creating these experiences is also about your own relationship with control and is a lesson in trying to design anything interactive: allowing your user/viewer/participant the freedom to properly explore. “You have to take risks for people to have their own experience – allow people to explore and go ‘the wrong way'”. Within DITD, allowing participants this freedom meant that people were having their own experience – speaking from experience, I would agree with this! Interview with ANAGRAM at i-Docs 2014 from DCRC on Vimeo. Following their success at Sheffield, May and Amy are now planning a UK and international tour for Door Into The Dark, alongside working on other new interactive documentary projects at the PM Studio. Keep up to date with their activities by following them on Twitter or visiting their website.